The elongated village Giethoorn is located in one of the largest areas of the Nature Association for, NP “De Wieden “. Along with the “Weerribben” it constitutes the largest continuous fenland NP areas in northern Europe. Way back in time peat diggers took peat from the soil, leaving it to dry and later cut peat. In two large floods (1776 and 1825) this vulnerable drying banks were washed away and lakes arose around Giethoorn. To transport the peat they dug ditches and canals that resulted in the typical village structure of Giethoorn. The traditional transportation for Giethoorn is the handmade wooden ”Gieterse Punter”. (A small sailing barge) Today there is also the ‘whisper’ boat. An easy to use, environment-friendly, noiseless electric version. 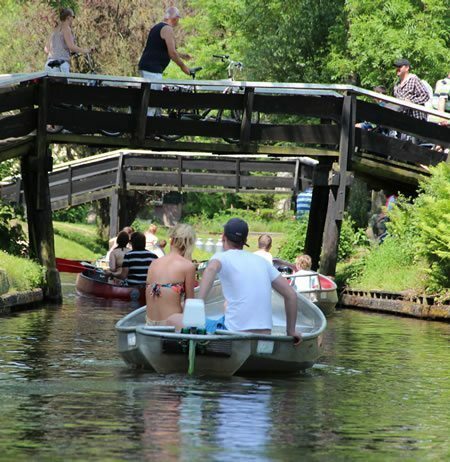 Furthermore Giethoorn is an excellent starting point for canoe trips through the area. Another possibility to appreciate Giethoorn from the water; a trip by (covered) boat. The village offers a number of special museums. And for a varying range of art, you are welcome in the various Giethoorn (art) galleries and see craftsmen at work. In winter the “West Overijssel” area is one of the finest Dutch skating areas, the ice will give you access to unique places…. Plenty of reasons to stay a day or longer in Giethoorn! 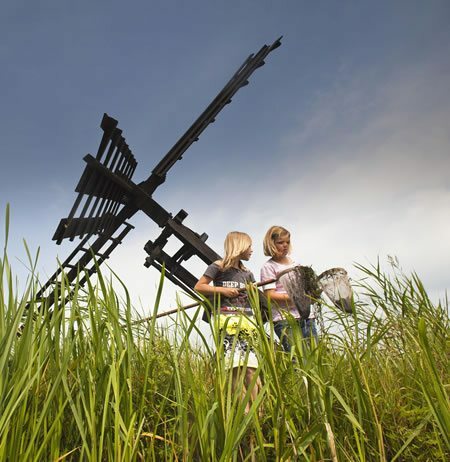 De Weerribben-Wieden National Park is a peatland that was largely excavated by a small population.. The peat developed after the last ice age. When the temperature rose on Earth and the ice melted, large wetlands arose where water was and shore plants grew. In the acid and oxygen-depleted water the dead plants devoured badly. they were washed away. This created large puddles, found in “De Wieden”, part of the National Park . Peat extraction until 1920 continued to be of great significance for the region. Then the usable peat ran out and peat extraction was unprofitable. The local population gradually switched to reed and hay management. And along the shallow verve income ‘ward’ were again grew aquatic and riparian plants which developed reed beds. Rietland Management became an important source of income .